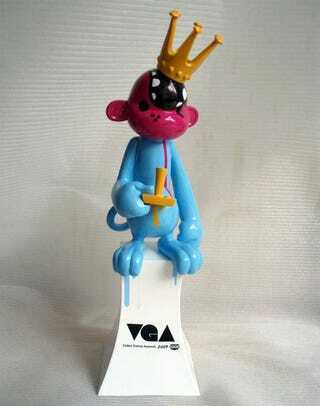 When Spike TV's telegenic hosts hand out awards at this year's VGAs show next week, this, the Vector Monkey as designed by LittleBigPlanet developers Media Molecule, is what winners will walk away with. Yes, Megan Fox, this could be yours! How did Media Molecule get wrapped up in the Spike TV Video Game Award statuette designing process? Well, Spike TV asked them. The developers won "Studio of the Year" honors at Spike's award show in 2008. Media Molecule's design signals the start of a new tradition, with this year's award winner planned to tackle a new design for next year's show, which is based on a sculpt originally created by vinyl toy experts Kid Robot. That means next year's VGA prize will be designed by a "Studio of the Year" nominee—Infinity Ward, Naughty Dog, Rocksteady Studios or Valve—should things go as planned. To see who's going to get all these colorful monkeys, turn your television knob to whatever channel Spike TV is on next Saturday, December 12.